I would describe my attitude to football as neutral. Unusual where I grew up and still live… In Liverpool. Somehow the passion all around me has passed me by for all these 47 years. ‘Are you a Red or a Blue?’ I am asked. But during the Derby, when red and blue collide and the city falls to silence, there is often one lone but very loud sound: That’ll be me making a phone call. So there I was at Liverpool’s Open Eye Gallery (photography) last week watching one of my oldest and dearest friends, and life-long Red, Jacqui McAssey, talk about her favourite subject: Football. Unlike the beautiful game, Liverpool’s passion for female friendships is something I do know all about; indeed, Jacqui is surely one of my gang, my crew, my posse. It wasn’t a surprise then that women’s friendships and solidarity were right at the heart of her talk. About a quarter of fans at any given match in the UK are women, a fact that came as a surprise to me last week. You would never know it from media coverage and sponsorship, would you? During the Q&A after Jacqui’s talk, one Liverpool lady commented that when she told her dad she was going to a talk about women football fans, he was ‘on fire about it’, saying, ‘there’ll all be more Blues than Reds…’, of course he is a Red. In-fact opposition to women attending matches, enthusing, discussing and knowing about football is plentiful. But, still, only 2% of women fans say they would be put off going to matches because of the sexism they face, even though half of women asked were affected (figures from Fans For Diversity: Women at the Match, a report by Fiona McGee 2014-2015). Jacqui told the story of her football Zine, Girlfans. Zines are of course a long-held football tradition, small home-made magazines that emerge from fans’ personal interest in the match, rolled up and secured like secret treasures in the inside pockets of men’s jackets: full of strange references, obscure historic football matches, names I have never heard of and jokes I could never hope to understand. A heritage of generations gone by, but also of today, tomorrow and next year, passed from father to son. Jacqui knew she wanted to create a Zine for women, it was sorely needed – it had never been done before. Girlfans began as a photography project at Anfield back in November 2013, at a game against Fulham (4-0 to Liverpool) which she attended with her friend and fellow photographer Alex Hurst. Jacqui loves to take pictures, especially of her friends on a night out, or day out… And at work she is a fashion stylist. So it makes sense that the story of football from match to match, season to season and through each decade is told through portraits of character and style. Just like more traditional football Zines, fans create this story themselves; the pictures are captioned only by the date they were taken, and the score of the match being attended. Perhaps even more than traditional Zines, women’s football fan culture has remained a hidden treasure, until now. Over the past few years Jacqui has begun to uncover those riches, photographing fans of other teams, first Everton, now Manchester City, but the rest of the UK awaits. She jokes she will run out of years in her life before fans to photograph. The army of pink merchandise and modest-but-still-suggestive-v-necked shirts are often ignored by women at the match. 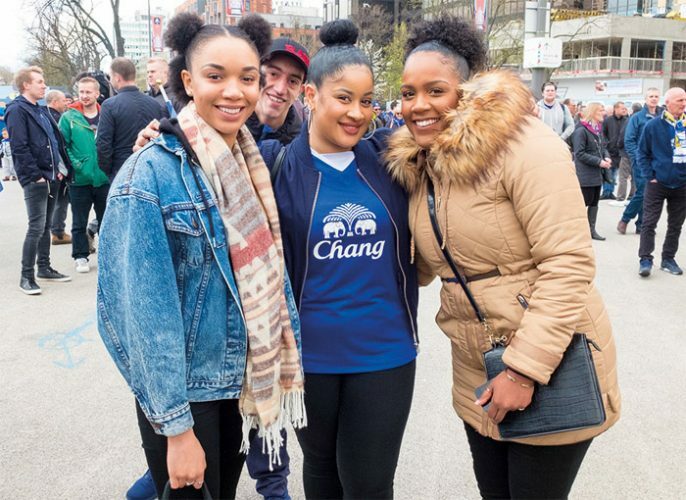 Instead, vintage, oversized kits – one Manchester City fan wears a shirt from a season during the 1990s – are tucked and shaped with cross-over designer bags or worn loosely. Child-sized shirts are popular, a good fit for many women, one of whom brought Audrey Hepburn to Anfield with a string of thick pearls at her neckline, and a fifties-style hair-do. Or there was the French fan, dressed like a soccer-black panther in a zipped-up black leather biker jacket with, yes, a black beret, and big dark shades. Splashes of red and a ‘Don’t Buy the Sun’ badge at her heart bring us back to Merseyside and LFC’s own history of struggle. The only pink page in each Zine is that season’s fixtures on the inside back cover – which I learn is a football Zine tradition. 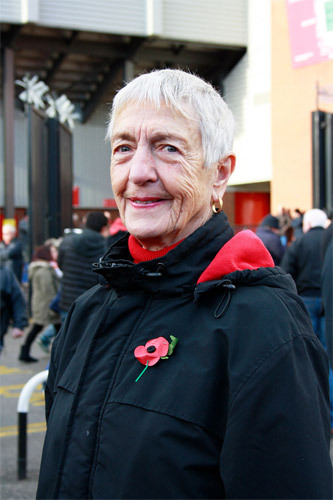 Calm dignity and elegance emerges in the figures and faces of older fans; grace under fire, the salt of Anfield. One woman faces the camera side-on in a classic portrait pose, her cropped white hair frames a face that shows stoicism and joy all at once. Warm eyes that we can imagine have looked upon children, grandchildren, a husband, and a working life now turn to the football pitch and her fellow fans. Whatever else she is or was, right now she is a Red. She too dresses in black with a remembrance poppy at her heart, a red polo-neck peaking over her jacket collar, and a glimpse of the red lining to her hooded anorak framing her face. Away from the football ground you wouldn’t guess why. Maybe she is just an elegant lady, even in her anorak, you might think. Jacqui shows us the final photograph. It is a back view of a small flock of mature fans as they head towards the ground at one of the matches. They all wear grey or black knitted ponchos, not an uncommon sight on British streets. But in this context, one can’t help but think of Clint Eastwood striding into town with metal plates under his poncho. 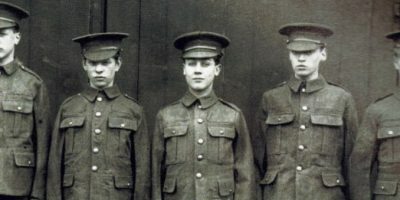 But these gunslingers are not alone, and perhaps their armour and cool demeanour lie not just in their ardour and perseverance for the game, but also in their solidarity.